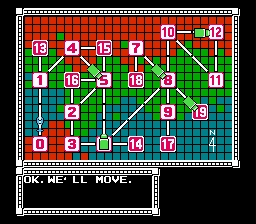 These are the best games that have been released for the Nintendo Entertainment System aka the “NES”. These games are the ones that were great when released and are still great today. 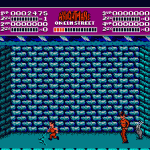 Double Dragon 2 was released in 1990 by Acclaim for the NES. Double Dragon 2 was a port of the beat em up arcade game of the same name. 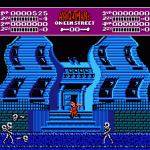 The NES version contains five more levels of gameplay for a total of nine levels. 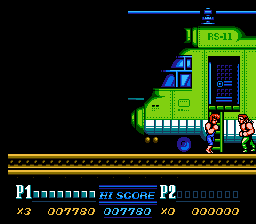 The NES version also added cut scenes in between levels. 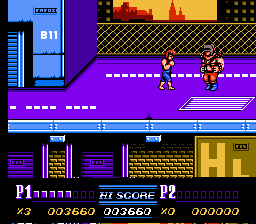 Double Dragon 2 is remembered as being one of the better arcade game to NES ports from back in the day. You play as the brothers Billy and Jimmy Lee. 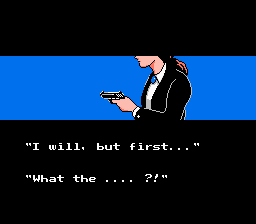 You are fighting to avenge the death of your girlfriend Marian who was killed by the last boss of the game called the Mysterious Warrior. 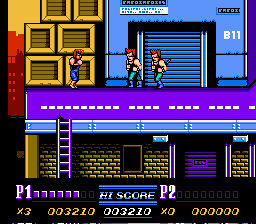 Double Dragon 2 had something that was missing in the first NES version of Double Dragon: two player co-op mode. Now you could play through the story with a friend which made things a lot more fun. Thankfully you can choose whether or not you wanted to be able to hurt your co-op partner by selecting either game mode A or B. 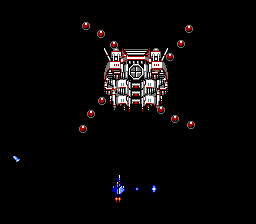 In Mode A, if you hit the other player you will not hurt each other and with Mode B, attacking the other player will give damage. 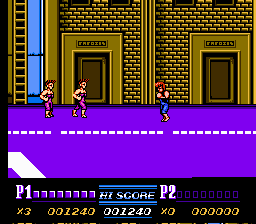 The fighting gameplay has changed from the first Double Dragon a bit also. Depending on what side of your character the enemy is on the punch and kicks button switch. So instead of just A for punch and B for kick it changes. A lot of gamers didn’t like this but I don’t think it’s that big of a deal. It didn’t take me long to get used to it but I guess everybody is different. A new move was added a spinning hurricane jump kick. It’s a good move to use to clear out areas with a lot of enemies. 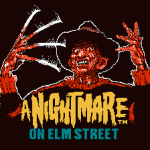 The controls are good but in some areas of the gameplay and in other areas they are bad. 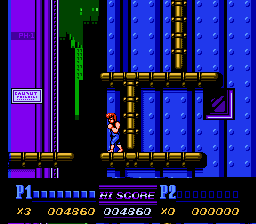 The player vs enemy controls are well done but in some parts of the game you need to make jumps over pits like in a platformer game but Double Dragon 2 isn’t really made for that. It can be difficult and frustrating in some areas but it’s not enough that it ruins the gameplay. It just feels like you can die some really cheap deaths. 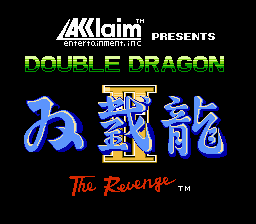 Double Dragon 2 is cheap to purchase off the internet on sites like eBay. 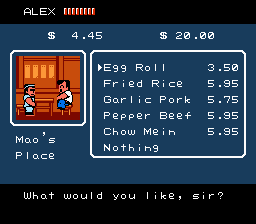 It’s defiantly worth the little money it costs to add it to your NES game collection. The two player co-op mode is where it’s at! 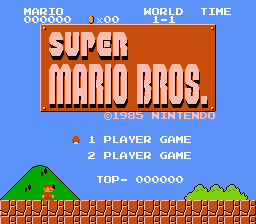 Super Mario Bros (SMB) was released in 1985 by Nintendo for the NES. 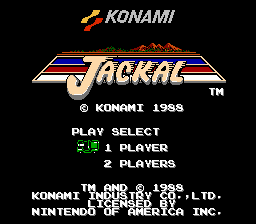 It’s easily one of the most recognizable video games ever and the most popular game ever produced for the NES. 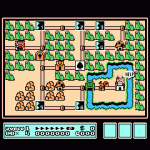 SMB was the best selling video game for more than 20 years selling over 40 million copies. 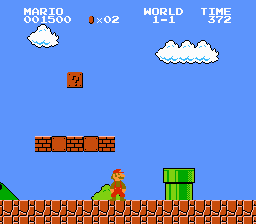 Super Mario Bros popularity is what led to Mario being a household name and on products from food to underwear. It also resurrected the video game industry after the great video game crash of 1983. 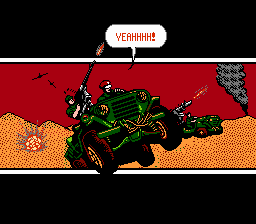 SMB was the sequel to the arcade classic Mario Brothers. 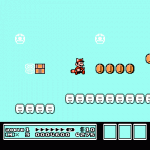 The gameplay is similar to Mario Brothers but there are differences ie: in SMB you can jump on a turtle to kill it, in Mario Bros you had to jump to hit the turtle from underneath and then run up to it and kick it. 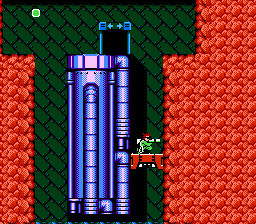 The story goes that the evil Bowser had kidnapped Princess Toadstool. 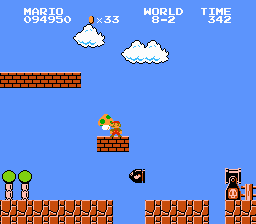 You can play as either Mario or Luigi on your quest to find out what castle Bowser has Princess Toadstool hidden in. 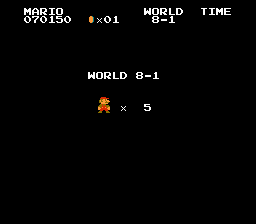 There are 8 worlds in the game. 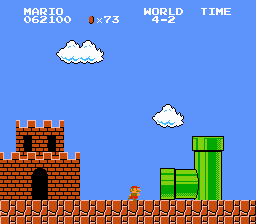 Each world consists of 3 levels and 1 castle level. To complete a world you must defeat all 4 levels. 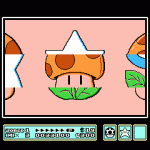 SMB was the first time you could get a giant mushroom, a fireflower to throw fireballs or the famous invincibility star. These became Nintendo staples would be forever understood by gamers and appear in countless Nintendo games to this day. 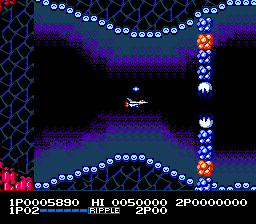 SMB was available in several different cartridges for the NES. 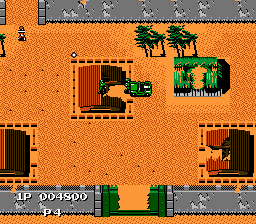 You could get SMB by itself, in a combo cart with Duck Hunt, and with Duck Hunt and World Class Track Meet in another combo cart. There are also 5 screw cart and 3 screw cart variations available. 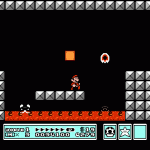 There were some famous glitches in SMB. The infamous minus world glitch is one that comes to mind. 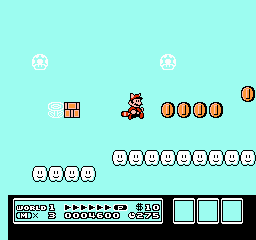 Some of the other glitches involved mushrooms falling through the screen and infinite 1ups that can lock up the game. 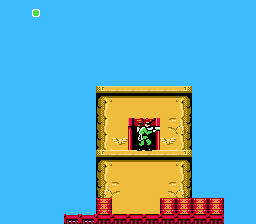 SMB is one of the cheapest to purchase NES games so there’s no excuse if you don’t own a copy. 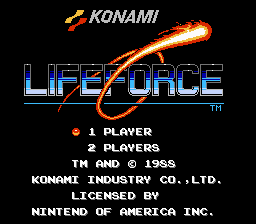 It’s a video game masterpiece that will always be remembered as one of the greatest games ever. 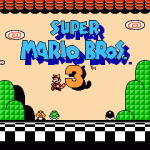 Super Mario Bros 3 (or SMB3) was released in 1990 by Nintendo for the NES. 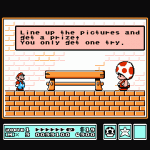 Super Mario Bros 3 was a huge success that was extremely popular and continues to be until this very day. 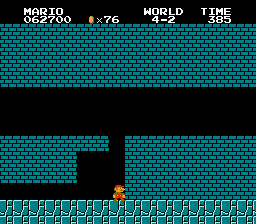 The story is pretty much the same as all the other Mario games in that the evil Bowser has kidnapped Princess Toadstool and it’s up to Mario and Luigi to rescue her. The gameplay is more like Super Mario Bros than Super Mario Bros 2 which depending on who you talk to is a great thing. 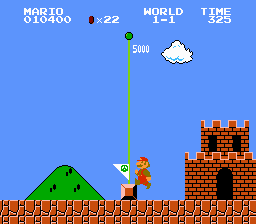 There’s more powerups in Super Mario Bros 3 that allow you to do things like fly and turn into a statue. 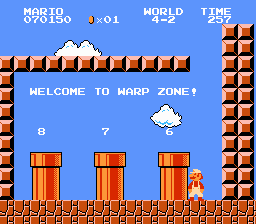 There are 8 worlds to explore. 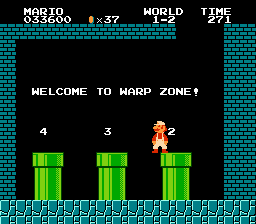 Like in the previous Mario games you can warp to different worlds, only this time you need to use a whistle to accomplish this task. 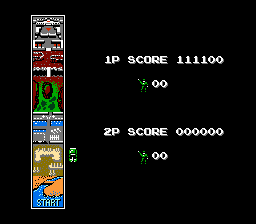 There are two different main screens for the gameplay. One being a map where you can move your character to go to different levels or mushroom houses, card games or castles. 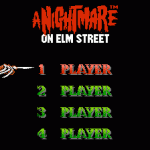 The other mode is the gameplay of each level. 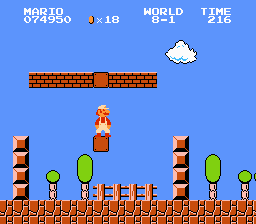 This is where the gameplay builds off of Super Mario Brothers. 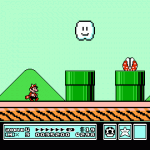 A fun feature is the ability in two player games to battle against each other in the original Mario Brothers mini game. 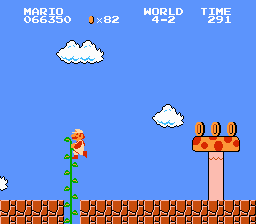 Super Mario Bros 3 was also featured in the 1989 movie titled The Wizard. It was basically an hour and a half long commercial about how cool Super Mario Bros 3 was and all the other Nintendo stuff back in the day. Even the crappy Power Glove makes an appearance. 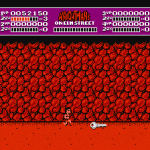 Who can forger the epic cheezy line from the Wizard: I love the Power Glove its so bad! 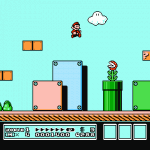 Super Mario Bros 3 is one of the best games ever released for the NES. 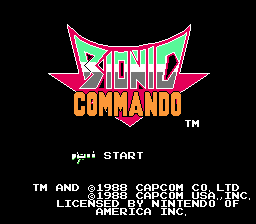 It’s a must have if you have a NES. 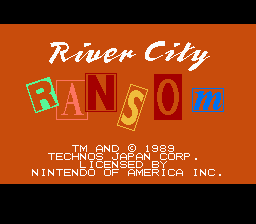 River City Ransom was released in 1989 by Technos of Japan for the NES. It’s a beat em up style game that combines RPG elements. 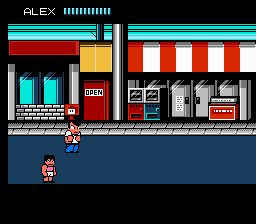 These two genres make a good mix and River City Ransom has some excellent gameplay as well. You play as Alex and Ryan. The story goes that Ryan’s girlfriend has been kidnapped by an evil dude named Slick. As you are on your way trying to rescue Ryan’s girlfriend, you are confronted by 9 different gangs depending where you are in the city. They all want to kill you for being on their turf. It’s up to you to show them who’s boss. 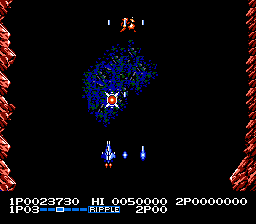 The fighting gameplay is like Double Dragon where you can pickup weapons that are dropped from defeated enemies. You can perform kicks, punches, and jump kicks. 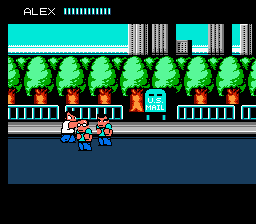 River City Ransom has two player simultaneous co-op which really makes the game a lot more fun. Teaming up to take on the gangs with a friend is a great time. 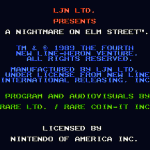 The NES cartridge is not terribly rare but it does fetch a bit more than most carts of it’s era. It’s usually around $20.00. 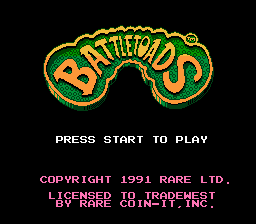 Battletoads was released by Tradewest in 1991 for the NES. It’s is a beat em up platformer game. The story goes that an evil woman named “the Dark Queen” is trying to take control of the universe. She kidnapped one of your toad buddies (Pimple) so you need to save him. 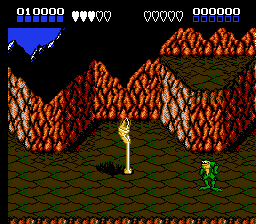 You can play as either of the other toads: Rash or Zitz. As the story unfolds you learn more about the Dark Queen’s evil plans and how you can stop her. 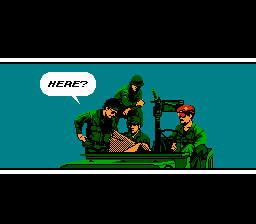 This game has very good graphics for it’s time. 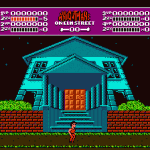 Since it was released in 1991 a lot of gamers had moved on to other systems like the Sega Genesis or Turbografx 16. 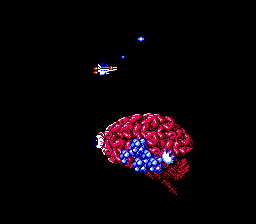 The gameplay is fun and very challenging. 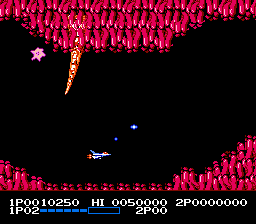 It’s really the best playing in two player simultaneous mode with a friend. It’s much more fun to play the game through in co-op except the only bad thing is that your friend can hit you so you need to be careful not to kill each other. 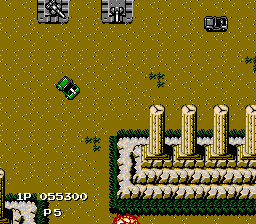 To me, this game is fondly remembered as one of the hardest games to complete for the NES or any system for that matter. It also has some of the best ever in game pause music. If you don’t believe me try it out! 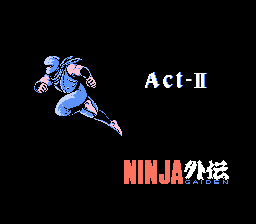 Ninja Gaiden was released in 1989 by Tecmo for the NES. 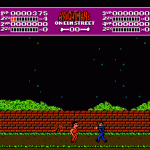 The gameplay is that of a side scrolling platformer game. The gameplay is addicting and challenging and that’s why there have been so many more sequels to this game. This is the one that started it all. 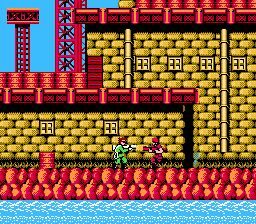 You play as ninja Ryu Hayabusa who has come to America to kill those who have murdered his father. As the story progresses you find out you need to help save the world. There are 6 main acts which comprise of 20 stages of levels. 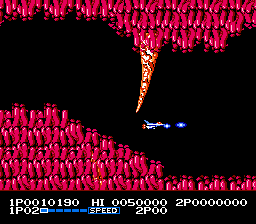 This game received high praise for the get quality cut scenes it used. For it’s time it was well done and really added something to the game. It helped to better tell the story and make the game player feel more involved. One of the negatives about the gameplay is how Ryu bounces back when hit. 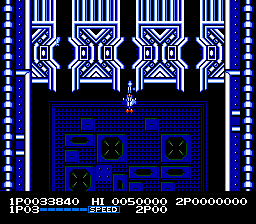 This can make some of the levels difficult especially when it’s crowded with enemies or there are pits nearby. 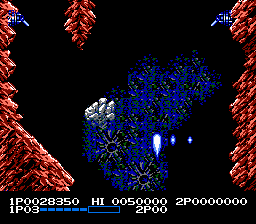 Many games of this day used this type of collision detection schemes so it’s a small complaint. 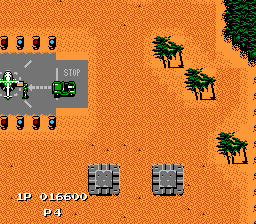 When it was released it was well received and it soon become a favorite of many NES gamers. 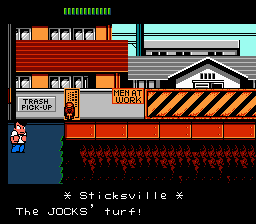 All of the sequels for the NES were also well remembered as quality games. 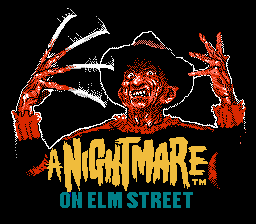 If you’ve never tried this game you’re missing out on one of the best NES games ever!